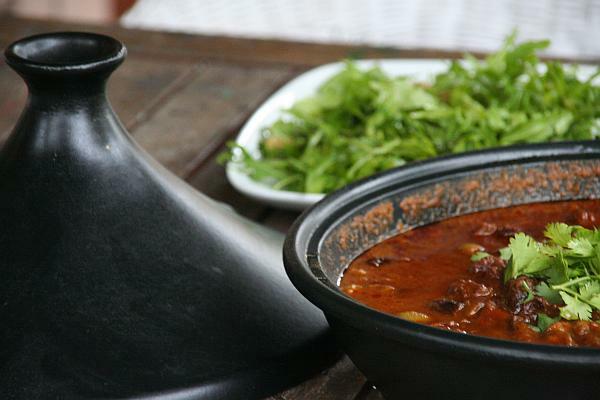 Heat the oil into a tagine and cook the steak brown for 5 minutes. Transfer them into a plate and heat the rest of the oil. Fry the onion, garlic, coriander, orange rind, cumin and seasoning. Cook for 1 minute and add tomato paste. Toss for another minute. Add the beef back into the tagine and pour stock and 1 cup of water to it. Bring it to a boil and simmer for 1 hour. Throw in the olives, prunes and again cook for 1 hour or until the steak is tender. Remove the orange rind and add parsley on top.